Those who wish to participate should first read the Design a NEW Pirate Sub-Theme Project Overview. 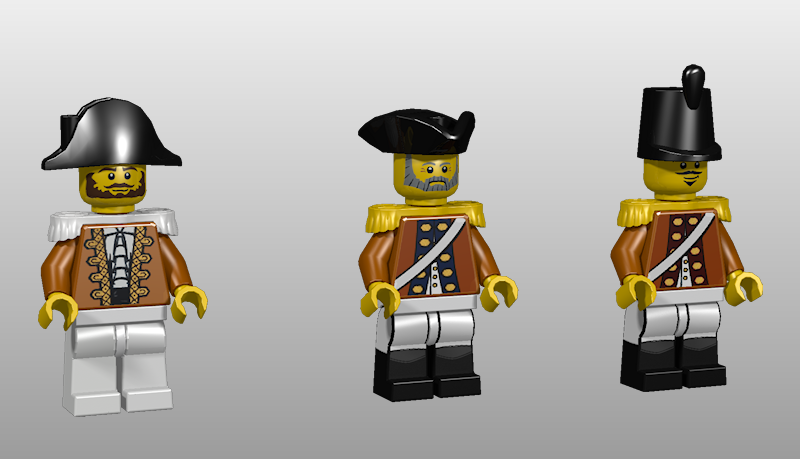 If you'd like to submit a Merchant or Smuggler design, please visit this thread. After conducting a series of polls (first poll & second poll) we have determined the faction's name shall be "Haven Guard" and their torso colour shall be dark orange. 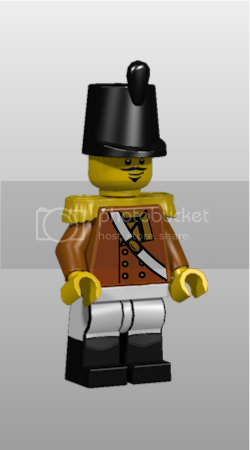 So now what we need is a unique torso design which we can use in a LDD rendering. We also need Haven Guard Flags! Provide feedback on the designs below or submit your own! The below designs based on the painting "Banquet of the Amsterdam Civic Guard in Celebration of the Peace of Münster" by Bartholomeus van der Helst. I'm definitely willing to try designing a uniform, but it might have to wait until the weekend... I might see what other people have done and try designing variations. Key thing to remember is: "No more than 4 printed colours; and the black lines count as one of those 4!" I don't remember that key thing anywhere. There are many torsos with more than 4 colors. More colors means a greater cost, but it is possible... Limiting to 4 colors is enough I think. Can I just vote for the standard "Imperial Guard" design as shown above (w/red facings) now please. The design is not entirely new, as it is a mixture of elements from existing torsos. Nice designs, Yooha. The one on the left looks rather plain, it seems a secondary contrasting color is needed and gold won't do the trick. The one on the right looks best, though those are dark red facings, are they not? Red would seem a better choice, since dark red isn't distinct enough. Green facings might also work, but then, they might also not be distinctive enough. And might I suggest the cavalier/musketeer hat as headgear? Nice work - it's a good start! Great! I'd love to see the leg printing with the torso on the left. 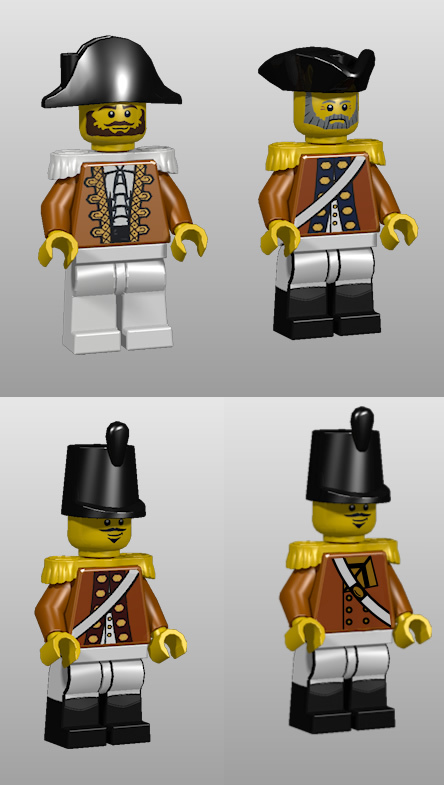 Maybe a bit fancy though...hmm, could we use the one on the left for officers or high ranking people and then maybe the one from the center for normal troops. Perhaps more than 4 colours is possible but I've not seen evidence of it. From my investigations I've only found one torso where there are more than 4 colours; the caveat there is that there were 4 colours on the front and 4 different colours on the back which might well be printed in a separate passes and therefore could utilise a different set of colours. The conclusions that I was drawing from my investigation is that the printing machines that they currently have are set up to handle 4 colours. As Yooha has already observed the base colour (the plastic) is separate from the 4 printed colours. Every time we add more printing it's more cost, either the set price has to go up or the number of parts has to go down. This is the trade-off that the TLG design team face on a daily basis and we will also have to face up to. I will be holding the participants accountable to the rules being drawn up in the definition of design constraints because the truer to the TLG style that we make our designs the more chance we have of TLG considering them as they stand; the more fanciful they are the more likely they will receive a IDEAS (nee CUSOO) style redesign. With the modifications you suggested. Looking at them like this I think I prefer the third one. 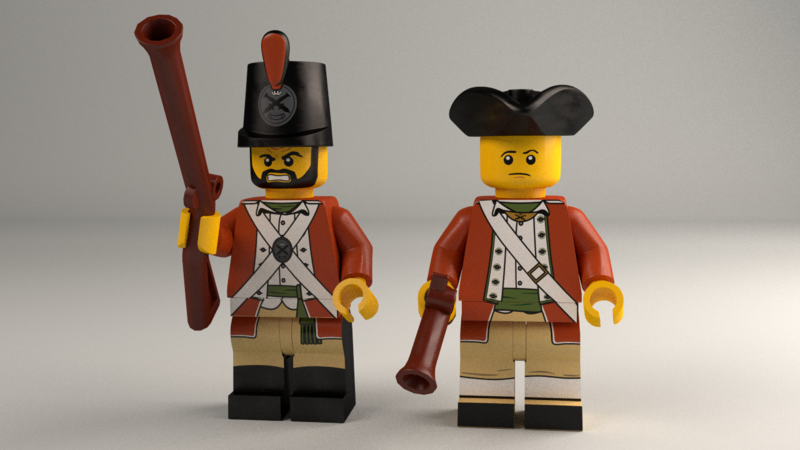 The uniform was inspired by something I saw when I googled for 'historic uniforms', but since the page wouldn't load for me, I couldn't say who the uniform originally belonged to! I'm very fond of asymmetry which is why the design appealed to me. I have to say that I think I prefer the Dark Blue or Dark Green facings to the Dark Red. This probably stems from the fact that Green and Blue are opposite orange on the colour wheel where-as Red is adjacent and therefore the former colours stand out against it more. 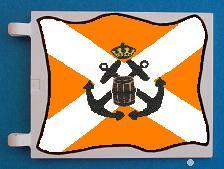 I probably should mention we flags that compliment the design - anyone good at designing flags? 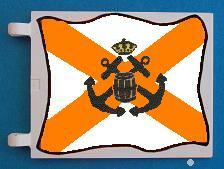 As a traditionalism I suggest the classic flag in organge! 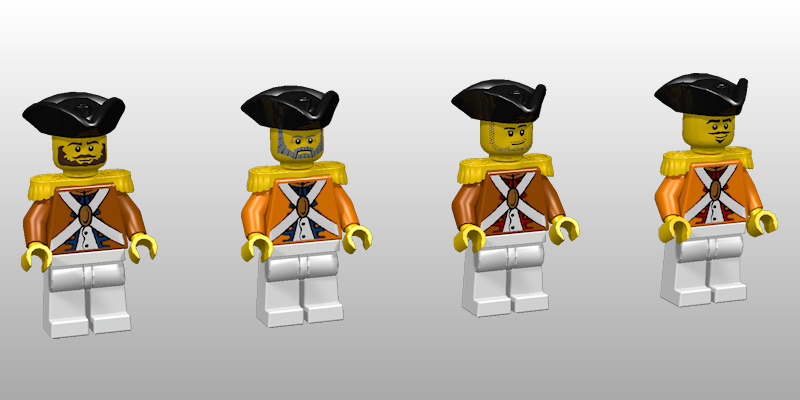 But dark orange would make for a drab and poorly visible flag, while regular orange was dropped. I suggest the color should be whatever color we decide for the facings. As for the pattern, the Bluecoat flag was a whte cross on blue, the Redcoats had horizontal stripes, so for our faction I suggest something new, like vertical stripes or an saltire (X-shaped cross). Then for the charge, we could have the initals "H G" on the flag, like the "VOC" logo on the Duch East India Company flag, if we're going for a Dutch-inspired faction. Or else we could use the traditional crossed cannons. Just brainstorming. 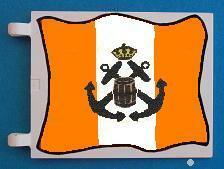 I think the emblem that appears on the flag of the Haven Gaurd should be the crossed anchors with barrel and crown that appears on the sail of the small ship in the Imperial Trading Post set. The colors of the background could be in the form of an orange-white-orange tri-color, with the stripes running horizontally (or vertically, I think either form works). I like this idea, but I think a saltire for the background would look much better than stripes. Thanks for mocking these up! Personally I like the second one the most, but it might be a bit too Spanish looking. The first one might be a better idea. I have to admit, the vertical stripes are not as bad as I thought they'd be. I think the crossed anchors, barrel and crown design is a little small against the Saltire, they need to be about half as big again. Also, the same as with the torsos, 4 printed colours maximum on top of the underlying plastic colour. If your plastic is grey, then you've got orange, white and black (for the outlines), which leaves you with just one other color for the crown or barrel. If you lengthen the anchors then the barrel can be larger and sit central, also try moving the crown to the center of the triangle up in the upper quadrant of the Saltire. I think if you play around with the sizing and positioning a bit more you'll find something even better than you've already got. I also like the second and third flag designs. I don't think the anchor design is too small, there are actually real flags that have designs even smaller than that so they fit neatly within the middle bar of horizontal or vertical stripes. Egypt... Nicaragua... Peru... although these flags we're designing are intended to be printed on rather small areas, so I guess that wouldn't work so well in this case. 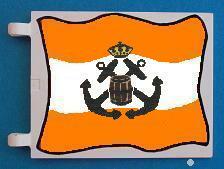 I just think the proportions of the crown/barrel/anchors need to be adjusted a bit. I like the ones with the cross-pattern, and maybe the 2nd is better. Apart from the grey, white black and orange are enough for me, I don't see the need of using gold - or any other - color.